Though the act of performing bird control falls under the realm of the pest control industry, the business side is much different than traditional insect control. Here’s what you need to be successful in the bird control game. Coming up with a narrative about bird control for PCT readers is an increasingly difficult task. With access to past articles so readily available on the internet, it wouldn’t be a real value to readers if an author were simply to rehash previously covered subject matter. (I went back as far as 2006 issues to make sure this contribution to the industry body of knowledge would not be redundant.) What I found, however, is that not much has changed in the past 11 years. Although bird control hasn’t been in the consumer news in recent years like bed bugs or mosquitoes, birds haven’t gone away and the opportunity is still there for qualified providers to do good business. Bird work is different than traditional pest control work. It is important to determine the measure of success in advance and ensure you can deliver. The costs associated with the risks of trying and failing are crippling to a project’s profitability when you are struggling with the callbacks or extra days of labor and expensive lift rental equipment. More importantly, you suffer damage to your reputation and risk losing future business if you fail to provide a positive result. Growing up in a pest control industry household, I was both subjected to and fortunate enough to have an opportunity to learn from the wisdom of an elder generation in this business. I was taught that “everything starts with a sale.” But what are you really selling when you’re in the bird control business? Are you selling a service? Are you selling a product? Or, are you really selling a solution to a customer’s problem? The various suppliers and manufacturers of bird control systems have been innovative over the years, delivering new products in an effort to bolster the arsenal of tools available to PCOs who perform bird mitigation. There are new variants of netting and installation hardware, improvements to electric track systems, new ledge deterrent systems, vaporizers, sonic blasters, ultrasonic blasters, laser blasters, a chemical sterilization compound and more. Customers generally don’t care which brand of spike, net or track you use. They don’t care what the break strength of the netting is or if there is one row of track on a ledge or three. They want a solution to work for their unique situation. They want a solution to last. They want to know that their problem has been resolved so they can focus their attention and resources on other issues. That said, they may want/need to be aware of project execution details to properly coordinate logistics on their end: will there be a scaffolding rig or boom lift used to access the work area, will they need to move the sofa to give you access to a work area, etc. They also will need to know about any expenses associated with maintaining a solution. PCT: How did you become a bird mitigation consultant? HW: The first thing that happened had nothing to do with the pest industry. I got a random call from an architecture firm looking for help planning bird control for an airport project. I jumped in to the project and found I loved that kind of work as opposed to the contracting and managing people business I had been doing for so long. I helped explain how to make a bird system work for their needs and how the details of a construction project can make a bird deterrent look better, work better and be installed easier. PCT: So working with architects is part of your business? HW: The way my work is shaped, I sit in the middle of people buying bird control like facility managers, government agencies and architects/engineers on one side and those who sell or provide bird control, such as supply companies or installers on the other side. One frustration from those who buy bird control is that it’s tough to get good information. They ask three different companies and get three different answers and three different prices. I come in as an experienced independent consultant with no agenda to sell anything and write up a scope of work with systems details so they can get apples to apples pricing from vendors to supply and install. What winds up happening sometimes is that I act like a coach to the client’s chosen vendor, helping them make sure they’re doing the right things to be successful on behalf of my buy-side client. PCT: What exactly do you do with PCOs? HW: When I was a design/builder, I loved the selling and the project planning/project management part of the work. I loved figuring out how to get the work done. But, I didn’t like some of the more internal management aspects of being part of a larger company. As an independent consultant, I get to do the parts I like, helping installation companies get work and get it done, without having to worry about being the manager responsible for the details like staffing, training, inventory management, etc. PCT: What are your typical activities? HW: It all depends on the client needs assessment. Some just need help finding more projects and so I’ll work with them on a marketing strategy or lead generation. It could be to act as a sounding board to think through a pricing exercise or to do a takeoff from construction documents. Others need help operationally with training of sales and project management or reviewing and implementing safety protocols. Some need an independent voice to talk to their customer and explain why something should be done or to perform a site investigation and plan an individual job. PCT: How do you define success with a PCO client? HW: My goal is to get more bird control work done successfully. That of course means I want the results of the systems installations to be real mitigation of client problems. But, it also means I want the companies taking on this kind of work to be successful doing it. That means safely and profitably. Public relations fallout from dying birds. Damage to the building, or worse, leaks from holes drilled on facades or roofs. Preventing access to areas that the client requires. Limiting building functionality in some capacity, such as preventing windows from opening. Simply moving the birds to an equally undesirable location. PRICING. Even though bird work is performed by the pest control industry, PMPs should not charge the same for bird work as they do the traditional pest services they offer. It can be a significant undertaking to invest in a one-time only bird control project — and even more so to create a whole business line dedicated to the niche. Customers generally don’t care which brand of spike, track or netting you use. They want a solution to work for their unique situation. And they want the solution to last. Also consider, relatively speaking, how low the cost of materials is for a bird control project relative to other construction trades. There is no fancy or pricey equipment involved in a project where a markup amounts to real added cost to cover overhead expense. Customers are paying for more than the sum of the parts. They are paying for a result. Delays due to work area access. Any other large construction project- related risks. Be truthful and willing to say, “I don’t know” when it’s necessary. Cordon off the work area to prevent risk to pedestrians and client staff. Make sure your teams are dressed appropriately with clean uniforms. Workers shouldn’t be smoking, even during outdoor projects. It’s actually a safety hazard as much as a customer experience issue. Installers should not discuss the work with random people at the site. Clean up after your work daily. Present completed work to the customer. Follow-up about results and potential additional work. PMPs should not underestimate these feathered foes. Bird job got you stumped? Well, birds are lot smarter than you may realize. Crows, which cause many problems, are “unbelievably smart,” said Dan Frankian, president of Hawkeye Bird Control in Halton Hills, Ontario. On the East Coast, they’ve learned to put crabs on the highway so cars run over them and crack open their shells, he said. Biologists say these members of the corvid family, which also includes ravens, rooks, magpies and jackdaws, are the smartest of all birds. Crows recognize facial features, can use and construct tools, and work in social groups. A 2009 study published in the journal Science suggests their cognitive abilities match those of chimpanzees and gorillas. Pigeons aren’t so dumb either: A 2011 study in Science found they can perform higher math on par with rhesus monkeys. Even sparrows learn to maneuver the sliding doors of “big box” stores with ease, said Doug Rolling, Northern Ontario district manager, Abell Pest Control. Editor’s note: “How Smart are Birds” originally appeared in the November/December 2013 issue of PCT Canada, sponsored by Univar. Heath Waldorf is an independent consultant and principal of Bird Control Advisory, a New Jersey-based firm that assists architects, governmental agencies and more with elimination or prevention of the problems associated with pest birds. Learn more at www.birdcontroladvisory.com/pct. Are you looking to get started in the bird control business? Here are nine tips from two of the industry’s leading bird control entrepreneurs. About 20 years ago Bird Doctor was started as an offshoot of Bug Doctor. Our Bug Doctor service specialists had dabbled with bird work, performing small jobs such as installing bird spikes on window sills, applying bird gel on ledges or performing exclusion to keep birds out of a structure. We learned many lessons in these early years. I remember doing our first net install at a supermarket’s loading dock and what we calculated for the price compared to the final cost to install the net was more than we expected; this resulted in a loss. It was at that point that I realized if we were going to make a go at it in bird control we would have to make a study of it. There is always a price to pay when you’re learning a new business service line. However, the process of making small mistakes along the way will prepare you for the big jobs and allow you to deliver on your promises to the customer when the stakes are much higher. It’s always good to walk before you run. What we mean by that is to start off with small bird jobs and move up to larger ones. This will build confidence in your installation skills, product knowledge and job pricing. Doing work for Donald Trump and the Trump organization was a defining moment for Bird Doctor; it was our first six-figure bird job. After that job we knew the sky was the limit (no pun intended) and we became confident in our skills to install deterrents and also in our knowledge of pricing jobs. We developed our own internal worksheets for job costing and put numerous service systems and protocols into place. 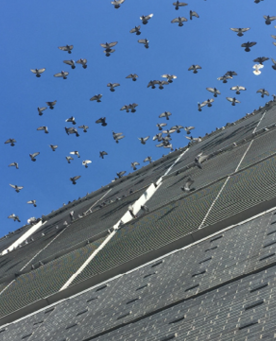 You may ask, “How do you obtain bird work?” There are so many ways to advertise your bird work services but most of our large jobs have come from cold calls generated by simply combing up and down buildings looking for birds and their droppings. Be brave, go inside the building and ask who is in charge of bird/pest control. 1. Read all you can to learn about the bird control business. Read past issues of PCT about birds. There are books you can purchase on bird control. 2. Google and research the websites of other bird control companies and you will learn quite a bit. 3. Talk to the bird deterrent suppliers and distributors as they have an interest in your success. They will be glad to provide you with training and support. Look at their websites and ask them to send you supply catalogs. Request that they send you bird deterrent displays to which you can refer when making sales presentations. Some of their websites have videos on various bird control methodologies. 4. If you’re just getting started, utilize another bird control company as your subcontractor so you can get the work done. You also can learn a great deal from them. We have assisted other companies when they were unable to get the work done. Recently we installed bird netting for another pest control company and they watched and videotaped our bird technicians doing the work. This was a win-win situation for both companies. It’s a great way to build industry relationships as well. When we were just getting started close to 20 years ago I called John Daly Sr., owner of Pigeons Away, a Division of Allison Pest Control, in Farmingdale, N.J., to discuss an airline hangar that called us for bird control. I knew that John was an expert in bird control and I was over my head on this job. I called him and invited him to join me on the walk-through of the hangar. John became a mentor. From that day on I knew I could count on him to help me when I had questions and simply for some guidance on unique jobs. He was always so gracious to spend as much time as needed and I will always be grateful for the time and wisdom he devoted to me. Don’t see your competitor as your opponent, but as a new potential friend and mentor who just might be willing to pass on some pearls of wisdom to you. 5. Check out YouTube videos on how to install bird deterrents and how to perform bird control. 6. Attend NPMA and NWCOA conferences as there are always sessions on bird control. 7. Hire experienced bird control installers to introduce bird control to your company. 8. Consider purchasing a bird control company and learning from them. We purchased a bird control company in our early days in business and we learned new and interesting techniques and also gained a great employee. This is how some of the large pest control companies obtain talent: They purchase it. 9. As you can see there are numerous resources right at your fingertips. There are safety items to be aware of when performing bird work such as taking an OSHA 10-Hour Course, ladder training, lift and harness training, scaffold training, respirator training, and wearing the proper PPEs when doing bird work. There are more than 60 different diseases associated with birds and their droppings so one must take care when offering this type of service. FINAL THOUGHTS. Performing bird control started out as an experiment but it turned into a viable add-on business. It took about five years before Bird Doctor became a segment of our business that could stand alone if needed. Bug Doctor was a great feeder program for Bird Doctor. In the beginning many of bird leads came from our parent company, Bug Doctor. What’s really exciting is that we started out doing bird jobs for a couple of hundred dollars; now we’re doing jobs that cost thousands. Still to this day we perform the small jobs because they can lead us to the larger ones. Plus all jobs keep our team busy. There’s an old saying, “Shoot for the moon. Even if you miss you’ll land among the stars.” I think you get my gist. Go for it! It’s time to get in the bird game! Stuart Aust is president/CEO of Bug Doctor and Bird Doctor Nationwide, Paramus, N.J. Daniel Aust is director of sales & business development. Learn more at www.birddoctorinc.com. A UF/IFAS entomologist earns a $200,000 grant to help develop a rapid Zika detection test. A University of Florida Institute of Food and Agricultural Sciences (UF/IFAS) entomologist will use a $200,000 grant from the Florida Department of Health to improve tests for the detection of Zika virus. In 2016, Florida saw 1,272 cases of Zika, which is usually associated with mild symptoms, although severe symptoms may also occur, including Guillain-Barré syndrome (a condition in which the immune system attacks the nervous system) and birth defects in babies (including microcephaly), according to the U.S. Centers for Disease Control and Prevention. Of those, 256 were locally acquired. Barry Alto, a UF/IFAS assistant professor of medical entomology, said scientists need better diagnostic tools to detect Zika virus to meet challenges to public health. He is working with Steven Benner at Firebird Biomolecular Sciences to develop methods they hope should take about an hour — far less time than current testing methods. Existing methods require specialized equipment and highly trained personnel, so samples must be transported to specialized laboratory facilities to perform the tests. Zika virus can be transmitted to humans by the Aedes aegypti mosquito, pictured here. Alto will work with Benner, a former University of Florida chemistry distinguished professor and founder of Gainesville-based Firebird Biomolecular Sciences. Together, they plan to develop an inexpensive, user-friendly and rapid diagnostic Zika test. Alto and Benner will combine current Zika-detection techniques with innovations in synthetic biology. Those include AEGIS (artificially expanded genetic information system), which allows pathogen nucleic acid-targeted tests to be ultra clean and SAMRS (self-avoiding molecular recognition systems) that allow ease of multiplexing of pathogen nucleic acid-targeted tests so other arboviruses can be detected in addition to Zika virus. During the one-year project, scientists will travel to Florida’s public health service labs to demonstrate the technique and to test their method to detect Zika and other arboviruses. “We are interested in getting feedback from individuals involved in mosquito control and public health,” Alto said. Zika can be transmitted when a female mosquito, most likely an infected Aedes aegypti, bites a human. Government mosquito boards don’t just trap and count mosquitoes. They perform research, partner with universities, and educate residents on diseases and disease prevention. Here’s a brief history of how officials in Harris County, Texas, protect the public and industry from mosquitoes. By James A. Dennett, Ph.D., and Mustapha Debboun, Ph.D., B.C.E. By In 2015, Harris County, Texas, celebrated the 50th anniversary of the formation of its organized mosquito abatement activities that, through the years, has gone by the names of Harris County Mosquito Control District (1965-95), Harris County Public Health & Environmental Services, Mosquito Control Division (1995-2016), and most recently, Harris County Public Health, Mosquito & Vector Control Division (HCPH-MVCD) (2016-present). HCPH-MVCD has had eight directors with the direct responsibility of conducting year-round arbovirus surveillance through mosquito collections and evidence-based mosquito control activities within Houston, the fourth-largest city in the nation, and Harris County, the third most populous county in the United States, which spans nearly 1,800 square miles and has an estimated population of 4.5 million people. Throughout the 52 years that HCPH-MVCD has been in operation, significant events, occurring in Texas and abroad, have helped shape its overall mission, operational methodologies and surveillance techniques through adaptation, innovation and incorporation of existing integrated mosquito control technologies. The following highlight some of the more notable events through the five decades and their impact on HCPH-MVCD. CURRENT RESEARCH. Research has always played an important role in helping HCPH-MVCD improve mosquito surveillance and control operations by using and incorporating current technologies (see figure 1). Internal and external collaborative research activities have covered numerous topics including mosquito bionomics, comparative mosquito trap testing, new control method evaluations, mosquito host feeding studies, ULV aerosol characterization and adulticide field efficacy testing. Figure 1. Testing the Larvasonic Field Arm in Harris County, Texas. Over the years, HCPH-MVCD has partnered with the University of Texas Medical Branch-Galveston (UTMB-G) and its world-renowned virologists in a West Nile virus (WNV) research grant from 2003 to 2010, with concentration on arbovirus ecology and evolution. In December 2016, the CDC awarded $10 million to UTMB-G to establish the Western Gulf Center of Excellence for Vector-Borne Diseases. The HCPH-MVCD is an important partner of this center and grant that will conduct research on Zika, other arboviruses and a number of vector-borne diseases present in the region. IMPACT OF ARBOVIRUSES. Of course, the impact of arboviruses in Harris County and Houston, Texas, has played a major role in the work HCPH-MVCD does. Saint Louis Encephalitis. The Saint Louis encephalitis (SLE) epidemic in the Houston, Texas, metropolitan area during 1964 was comparable in size to SLE outbreaks that occurred in the Lower Rio Grande Valley 10 years earlier in 1954. The Houston epidemic occurred from June 27 to Oct. 3, 1964, for 15 weeks, with peak number of cases in the 10th week (Aug. 29), with 243 cases (suspected and/or confirmed) and 27 deaths (not including 14 cases outside Houston city limits). Incidence and mortality rates were 19.5 cases/100,000 population, and 2.2 deaths/100,000 population, respectively, with 11.1 percent case fatality ratio (Luby et al. 1967). In the end, there were 376 confirmed cases of SLE and 34 deaths (Parsons 2003). Figure 2. The Microsoft Project Premonition trapping system. During the 1964 epidemic, the city of Houston provided residents 0.5 percent malathion through disbursement at 55 local fire stations (accounting for 151,000 gallons applied to private properties), 15 trucks equipped with power sprayers (provided by Communicable Disease Center’s San Antonio Aedes aegypti (L.) eradication project) were used for larviciding local ditches with diesel, and a U.S. Coast Guard helicopter applied larvicide and adulticide in the form of 5 percent malathion and 3 percent benzene hexachloride dusts (Anon. 1965). In response to the epidemic, county officials authorized the formation of Harris County Mosquito Control District, aided by a five-member advisory board, on Nov. 3, 1964. Harris County then budgeted $400,000 for the newly formed district in 1965 (Anon. 1965). 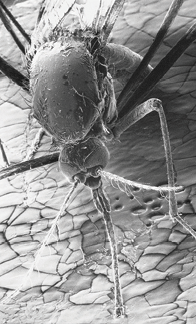 Its primary responsibility was to provide control of disease vectors with its operational foundation similarly based upon available mosquito surveillance and control techniques that were being used in Florida, with additional internal policies on insecticide use and environmental protection, that laid the groundwork for the insecticide resistance management (IRM) program that exists today (Bartnett 1990). Upon startup, the District proposed the creation of an encephalitis surveillance program, and an encephalitis laboratory, which was originally within the City of Houston Health Department, but later moved to the District (Bartnett 1990). Twenty-two SLE isolates from 69,387 Culex quinquefasciatus Say were collected from August-October during the Houston epidemic, with 12 isolates from 6,760 Cx. quinquefasciatus collected Aug. 23-29 (10th week of the epidemic) (Sudia et al. 1967). This immediately elevated the status of Cx. quinquefasciatus as the primary regional vector of SLE for 38 years, until 2002 when SLE all but “disappeared” and West Nile virus (WNV) was first detected within Harris County where it remains the primary vector of now endemic WNV. Regionally, simultaneous epidemics of SLE occurred in Texas during 1966, with 76 confirmed cases in Corpus Christi and 145 in Dallas. During both outbreaks, emergency operations using aerial applications of malathion (3.08 oz/acre) were conducted (Williams et al. 1975, Hopkins et al. 1975). During the Dallas epidemic, ground-based control operations used insecticidal fogs of 2 percent malathion/diesel and applications of 3 percent benzene hexachloride or 5 percent malathion dusts (Hopkins et al. 1975). Shortly after the epidemic, Corpus Christi began fogging all storm drain systems weekly/biweekly with 5 percent malathion/diesel (Williams et al. 1975). Subsequent SLE outbreaks have occurred in the Houston area through the years: 1975-76 (58 cases/11 deaths), 1980 (53 cases), 1986 (28 cases), and 1990-91 (65 cases) (Lillibridge et al. 2004). Houston had 10 SLE epidemics over a 26-year period, occurring at three-year intervals from June through November, usually occurring between mid-July through mid-August (Sprenger 1992). West Nile Virus. WNV was detected in Harris County for the first time in 2002, and at year’s end, 851 pools of Cx. quinquefasciatus out of 6,093 pools tested (13.97 percent) were confirmed positive (Lillibridge et al. 2004). Since 2002, WNV activity in mosquitoes has varied greatly through the years ranging from 23 confirmed WNV mosquito pools in 2008 to 1,286 confirmed pools in 2014 (Randle et al. 2016). According to U.S. Geological Survey data, during the period 2003-2016, there were more than 300 WNV human cases in Harris County. TREATMENT OPTIONS. Over the years, there have been a variety of mosquito control operations and treatments used by HCPH-MVCD. Thermal Fogging/Larviciding. In 1965, the Harris County Mosquito Control District initiated thermal fog applications throughout the county during the first season, and shortly thereafter, began fogging underground storm drain systems with malathion, naled (Dibrom), and fenthion (Baytex) for control of Cx. quinquefasciatus(see figure 3). Figure 3. Thermal fogging storm drains. A 1969 District monthly report (June) stated that 250 gallons of diesel oil/surfactant larvicide provided an estimated 24-hour kill of 102.6 billion mosquitoes in a single, mile-long ditch. In the 1967 District Annual Report, 152, 811 miles were driven over 191 nights during thermal fog applications of Baytex, Dibrom and malathion with 584,492 gallons of insecticide mix used to cover Harris County 12.6 times (Harris County historical unpublished data). Although limited thermal fogging continued in Harris County through the years, it was discontinued in 2010 due to poor results obtained during 2008-09 (Fredregill et al. 2011). ULV Applications. Introduction of the ground-based ultra-low volume (ULV) concept and several advantages that ULV had over conventional high-volume (HV) thermal fogging generators were made in 1968, (such as the extremely small amounts of insecticide required for applications and smaller overall equipment size required), and proved that ULV non-thermal (cold) aerosols were just as effective as HV thermal aerosols (Mount et al. 1968). In the 1969 District Monthly (March) report, there was mention of an invitation to Alameda County, Calif., to evaluate a new ULV ground applicator with the U.S. Navy. In the June-August Monthly reports, Harris County officials approved the purchase of a single LECO ULV application unit for the District that was tested, producing excellent results with malathion. The ULV revolution in Harris County had officially begun. A new LECO ULV cold aerosol nozzle that effectively applied malathion, naled, and fenthion against Ae. taeniorhynchus (Weid.) in Florida field cage tests was described, and some additional advantages of ground-based ULV were reported after field tests with malathion and Dursban against Cx. quinquefasciatus adults and larvae in Brazoria County, Texas, in that the effects of wind and temperature appeared to be less of a hindrance for ULV applications compared to thermal fogging. Additionally, the importance of ULV to mosquito control operations was accurately forecasted (Mount et al. 1970, McNeill, IV and Ludwig 1970). As one of the best public health insecticides ever offered, synergized resmethrin (Scourge) was successfully used in Harris County from 1984-2011 for 27 years. Insecticide Resistance and Management. Initial reports of regional insecticide resistance and its management within mosquitoes were published during this period. Highly variable tolerances to organophosphates (chlorpyrifos, malathion and naled) were reported in Cx. quinquefasciatus from two southeastern Louisiana Parishes, Galveston and Brazoria Counties in Texas. Highly active esterase activity in eight different populations of Cx. quinquefasciatus from Harris County suggested a broad range of insecticide susceptibilities and noted that the frequency of at least one esterase decreased during a five-year period when malathion use was very low (Pietrantonio et al. 2000). Insecticide resistance management has been active since ULV capability was added to the program in 1969. Seven permanent primary operational areas of interest and two to eight additional areas were selectively chosen for testing each season using a standardized field cage test procedure. This was unique in that a laboratory-susceptible strain of Cx. quinquefasciatus was tested alongside three wild populations to provide comparative efficacy of specific ULV adulticides applied against these populations three to four nights during the season (see figure 4). Figure 4. Adulticide field cage test methodology used in Harris County, Texas. The HCPH-MVCD uses evidence-based ULV applications primarily based on the type of arbovirus activity within an operational area. Applications to each area are rotated between chemical classes, namely organophosphates and pyrethroids, using a simple and highly effective method. An easily fabricated selective flow control system has been in fleet service since 2005 and permits rotation between two adulticides (malathion and permethrin) by simply turning a diverter valve (Self et al. 2010). The current 21-vehicle ULV fleet is also outfitted with Monitor 4 flow control and vehicle tracking systems that permit accurate recording of adulticide use and the actual location applications were made. Site Inspections. In preparation for potential Zika virus activities, HCPH-MVCD Inspection Section began area-wide assessments of peridomestic Aedes habitats throughout Harris County and completed in 2016 a total of 2,556 Resident and Service Requests from Harris County and the City of Houston. Elimination of breeding areas and limited spot treatments with methoprene, Bacillus thuringiensisisraelensis de Barjac, and B. sphaericus Neide-based control products are routinely performed to reduce mosquito populations on site (see figure 5). Figure 5. Site survey, source reduction and spot treatment. SURVEILLANCE ACTIVITIES. Millions of mosquitoes are collected each year; birds are surveyed as well. Discovery of Aedes albopictus (Skuse). During a routine survey for Ae. aegypti, mosquito collections made on Aug. 2, 1985, ultimately provided national recognition of the Harris County Mosquito Control District in the discovery of breeding populations of the introduced invasive Ae. albopictus in several geographically separated tire piles. Shortly thereafter, research funding was requested to determine distribution, genetics, insecticide resistance status, vector competency and legal implications, in addition to bionomic and ethological studies of the newly established mosquito species (Sprenger and Wuithiranyagool 1986, Bartnett 1986). Mosquito Collection and Virology Capabilities. The basic foundation of the SLE surveillance program, completed in 1990, was based upon research conducted by MVCD in 1979 and 1982 indicating that CDC light traps baited with carbon dioxide were very effective collecting Cx. quinquefasciatus in the extensive network of storm drain systems in the Houston metropolitan area, with more than 400,000 mosquitoes collected per year at 268 locations (Sprenger 1992). Currently, the entire county is monitored year-round, and quite heavily during the months of highest risk (May-October). The entire county (268 operational areas) is covered on a weekly basis using 134 storm drain (carbon dioxide baited CDC light traps) and 134 gravid traps, primarily for Culex collections to monitor SLE and WNV, set along 27 collection routes (with 6-12 traps per route). In 2016, 134 BG-Sentinel traps for Aedes surveillance were added to increase capabilities of detecting dengue, chikungunya and Zika viruses. Mosquito identification and pooling of the collections are made three to four days per week, with in-house virology laboratory analysis and test results occurring three times per week. Over most years, nearly 1 million mosquitoes are collected during routine surveillance each year. Avian Surveillance. Since 1965, active avian surveillance has been important in early detection of arboviruses circulating within the live bird populations throughout Harris County and the city of Houston. In 2002, dead bird collections began and provided additional ability to detect WNV activity. Both programs have detected considerable variation in WNV activity in bird populations with seroprevalence ranging from 2.9-17.7 percent in live bird blood samples and WNV positive dead birds ranging from 0.3-57.2 percent. EDUCATION AND OUTREACH. Educating residents not only on mosquito-borne diseases such as chikungunya and Zika and how they are spread, but also on personal protective measures against mosquito bites and source reduction steps that should be taken to reduce/eliminate mosquito breeding sites, are key factors in prevention. Ongoing prevention messages focusing on these topics are routinely provided to Harris County residents in an effort to impact the knowledge, attitudes and beliefs of the community toward mosquitoes and the diseases they transmit. Over the last year we have seen an increase in community engagement opportunities both as requests from community leaders and through community partnerships in place. In 2016, we participated in 131 community events, in addition to providing information through a number of other sources such as social media and traditional media outlets. Additionally, we provided more than 94 presentations to local community partners and national public health and legislative partners (see figure 6). Figure 6. Public education and outreach activities in Harris County, Texas. Authors’ Acknowledgement: We want to thank all of the past and present employees for their hard work and dedication towards the development and continued progression of the HCPH-MVCD in its mission to improve surveillance and control of arboviruses and other regional vector-borne diseases. James A. Dennett is a medical entomologist at the Mosquito & Vector Control Division with the Harris County (Texas) Public Health Department. Mustapha Debboun is director of the same department. Anon. 1965. Epidemic St. Louis encephalitis in Houston, 1964: a cooperative study. JAMA 193:139-146. Bartnett RE. 1986. The perspective of Aedes albopictus from the administrative viewpoint. J Am Mosq Control Assoc 2:418-419. Bartnett RE. 1990. Florida mosquito control methods used successfully in Texas. J Fl Mosq Control Assoc 61:13-15. Fredregill CL, Motl GC, Dennett JA, Flatt KL, Bueno, Jr. R. 2011. Thermal fog efficacy tests against mosquitoes in storm drains in Harris County, Texas 2008-09. J Am Mosq Control Assoc 27:61-68. Hopkins CC, Hollinger FB, Johnson RF, Dewlett HJ, Newhouse VF, Chamberlain RW. 1975. The epidemiology of St. Louis encephalitis in Dallas, Texas, 1966. Am J Epidemiol 102:1-15. Lillibridge KM, Parsons R, Randle Y, Travassos Da Rosa APA, Guzman H, Siirin M, Wuithiranyagool T, Hailey C, Higgs S, Bala AA, Pascua R, Meyer T, Vanlandingham DL, Tesh RB. 2004. The 2002 introduction of West Nile virus into Harris County, Texas, an area historically endemic for St. Louis encephalitis. Am J Trop Med Hyg 70:676-681. Luby JP, Miller G, Gardner P, Pigford CA, Henderson BE, Eddins D. 1967. The epidemiology of St. Louis encephalitis in Houston, Texas, 1964. Am J Epidemiol 86:584-597. McNeill, IV JC, Ludwig PD. 1970. Evaluation of ultra-low volume ground equipment in Brazoria County, Texas. Mosq News 30:625-628. Micks DW, Rougeau D. 1977. Organophosphorus tolerance in Culex quinquefasciatus in Texas. Mosq News 37:233-239. Mount GA, Lofgren CS, Pierce NW, Husman CN. 1968. Ultra-low volume nonthermal aerosols of malathion and naled for adult mosquito control. Mosq News 28:99-103. Mount GA, Pierce NW, Lofgren CS, Gahan JB. 1970. A new ultra-low volume aerosol nozzle for dispersal of insecticides against adult mosquitoes. Mosq News 30:56-59. Mount GA, Haile DG, Pierce NW, Baldwin KF. 1978. Aerosols of permethrin and propoxur for control of adult mosquitoes. Mosq News 38:39-42. Parsons R. 2003. Mosquito control- Texas style. Wing Beats 14:4-38. Pietrantonio PV, Gibson G, Nawrocki S, Carrier F, Knight, Jr. WP. 2000. Insecticide resistance status, esterase activity, and electromorphs from mosquito populations of Culex quinquefasciatus Say (Diptera: Culicidae), in Houston (Harris County), Texas. J Vector Ecol 25:74-89. Randle YH, Freeman CB, Jackson M, Reyna M, Debboun M. 2016. 2014: A record-breaking year for West Nile virus positive pools in Harris County and the City of Houston, Texas. US Army Med Dept J pp. 1-8. Self JM, Flatt KL, Reed RA, Bueno, Jr. R. 2010. Implementing a program for alternating insecticides in ground ULV adulticide applications in Harris County, Texas. Wing Beats 21:24-29. Sprenger D, Wuithiranyagool T. 1986. The discovery and distribution of Aedes albopictus in Harris County, Texas. J Am Mosq Control Assoc 2:217-219. Sprenger D. 1992. Disease surveillance. Pest Control (March) pp. 30-34. Steelman CD, Devitt DS. 1976. Development of organophosphate tolerance in field populations of Culex pipiens quinquefasciatus Say in Louisiana. Mosq News 36:361-363. Sudia WD, Coleman PH, Chamberlain RW, Wiseman JS, Work TH. 1967. St. Louis encephalitis vector studies in Houston, Texas, 1964. J Med Ent 4:32-36. Williams KH, Hollinger FB, Metzger WR, Hopkins CC, Chamberlain RW. 1975. The epidemiology of St. Louis encephalitis in Corpus Christi, Texas, 1966. Am J Epidemiol 102:16-24. The number one conducive condition for mosquitoes is standing or stagnant water. Here’s what you need to do to help customers and employees find and remove such environments. Editor’s note: This article originally appeared in a PCT e-newsletter titled “Targeting Mosquitoes,” which was sponsored by MGK. To control mosquitoes around a customer’s home, a pest management professional can spray the lawn and foliage with an insecticide, Insect Growth Regulator (IGR), or repellent, or offer a misting program to dispense insecticide into the air. But if the customer doesn’t do his/her part in eliminating conducive conditions on the property, mosquitoes are likely to continue to develop. This is one of the reasons it is so important for the pest management professional to not only inspect the entire property prior to recommending or providing treatment, but also to educate the customer on conducive conditions that contribute to mosquito development. This should include both any conducive conditions that are discovered during the inspection as well as conditions that are commonly found in backyards and in other residential settings. Virginia Tech researchers have found a gene that can reduce female mosquitoes over many generations. The findings were published Sept. 20, 2016, in the journal eLife. “The Guy1 protein is a strong candidate of the male-determining factor in Anopheles stephensi,” said Tu, a professor of biochemistry in the College of Agriculture and Life Sciences and a member of the Fralin Life Science Institute Vector-borne Disease Research Group. The Guy1 gene is not related to Nix, a male-determining factor recently discovered in the Aedes aegypti mosquito by Tu’s lab and collaborators. In order to produce all male offspring, all progeny needs to inherit this extra copy of Guy1. This is one of the group’s future objectives and can potentially be achieved by using genome editing. Yumin Qi, a research scientist in the department of biochemistry, is a co-author of the paper. “I think a lot of people have no idea where mosquitoes breed,” said Texas A&M Professor and AgriLife Extension Service Urban Entomologist Mike Merchant. So having someone who understands — and can explain — the mosquito life cycle and can explain where and how they will breed provides important information for homeowners. EDUCATING HOMEOWNERS. There are a variety of ways to educate your residential customers on mosquito control and conducive conditions, but the first step is for pest control company managers and technical directors to educate their workforce, Mannes said. This not only includes the PMPs who are out in the field, but also employees who answer the phones, so they can be the first step in providing factual information to consumers. 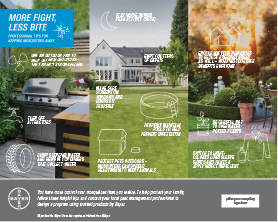 For PMPs who want to provide their technicians and/or customers with more information about preventing mosquito bites, visit http://bit.ly/2mmmjlP, where you’ll find a downloadable infographic from the Environmental Science Unit of Bayer. PMPs can print the poster, affix their logo to it and share with their customers. Use your company’s website and other digital means to provide factual information on mosquitoes, why control is important, where mosquitoes breed and what they can and should do for prevention. Regularly review professional sources such as the PCT and NPMA websites and publications to stay up to date on mosquito control, the diseases mosquitoes can transmit and other relevant information. Create or download fact sheets on mosquitoes and answers to common customer questions. If a customer has more questions than you have answers, you also can refer them to the NPMA consumer website, pestworld.org, for additional information. Refer specific questions on diseases, such as Zika virus, to medical professionals, the Centers for Disease Control and Prevention (CDC), state health departments and other health experts. “Remember, we are not experts in diseases, but we are experts in mosquito control,” Mannes said. CONDUCIVE CONDITIONS. Given these methods of education, the most important facts on which customers should be educated include areas of mosquito breeding, other conducive conditions and steps they can take for prevention. Merchant notes that a mosquito harborage inspection and recommendation service could be provided as either a value-add or an add-on service. Eliminate areas of standing water around the home, including those that are more obvious, such as birdbaths, baby pools, flowerpots and unchanged pet water bowls, as well as those that are often overlooked, such as gutters, fence posts with caps, wheelbarrows, buckets, tarps on boats and grill covers. Fill in any ditches or swampy areas the create puddling water, or keep them drained. If there are any stumps on the property, these should be removed or filled with mortar. To keep outdoor recycling containers from accumulating water, drill drainage holes on the bottom. Inspect and clean gutters annually, or more frequently if there are trees on the property that tend to drop their leaves on the roof or directly into the drain, causing them to clog. Although mosquitoes do not reproduce in tall grass or shrubs, these areas can provide harborage for mosquitoes, especially in shaded areas. Keep grass cut short, shrubs and trees trimmed, and keep low brush eliminated or well maintained. An Anopheles stephensi mosquito obtains a blood meal from a human host through its pointed proboscis. Keep mosquitoes out of the home by ensuring all windows and doors are screened and in good condition — repairing even the smallest tear or hole. If clients are planning to be outdoors for extended periods, suggest they wear long pants and sleeves and use an insect repellent containing DEET, picaridin or oil of lemon-eucalyptus. It is especially important to wear effective insect repellents and protective clothing if traveling outside the United States. Mosquito-borne diseases that may be rare in the U.S. are common in many other countries.